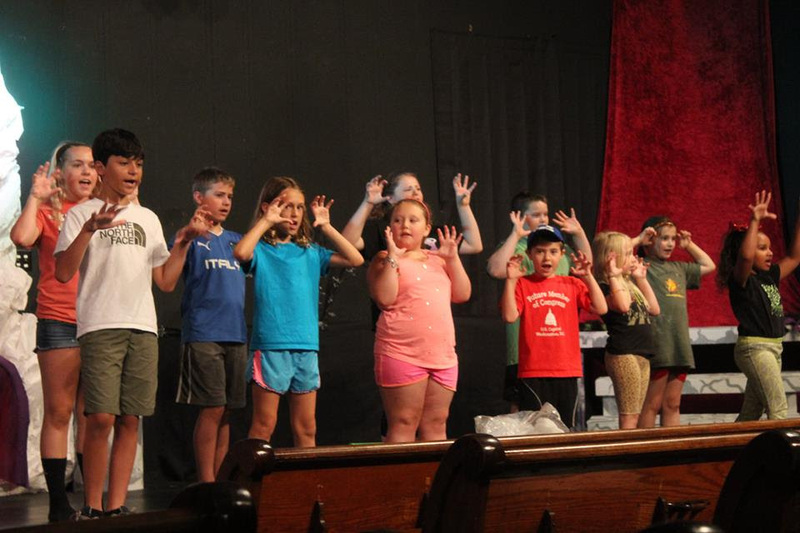 Little monsters are invading Bradford Little Theatre (BLT) when the cast of 24 campers take the stage at the conclusion of the second annual kid’s camp later this month. Directors Mandi Droney and Hannah Leposa are thrilled to be working with the talented group of children and teens from the area. “Camp last summer was such an enriching experience. I am thrilled to be back for a second year. Seeing the camper numbers grow by almost ten just shows us that we are doing something not only educational, but enjoyable,” says returning camp director, Leposa. 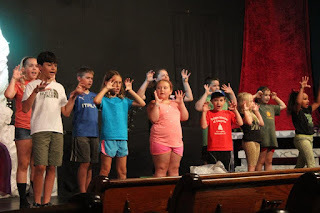 The campers are working each day to put together the one act musical, “We Are Monsters.” The show takes place deep in a cave where monster emcees, Targoyle and Fargoyle, are hosting a monster cabaret filled with werewolves, vampires, and an ooze monster. Targoyle and Fargoyle are played by Hayden Yanik, 11, and Lillian South, 8, respectively. Yanik is a first year camper while this is South’s second year. The ooze monster, Oozy Lumpa, is played by Kali O’Neil, 10, who is also attending camp for the first time. A group of three young humans infiltrate the monster cabaret to film a documentary about the monsters in their secret lair. Since Sunny, Jade, and Westerly aren’t old enough to drive they make the eldest of the humans, KC, bring them to the forest. KC isn’t interested in the documentary, but has his own reasons for entering the cave. KC, the eldest human, is played by returning camper Truman Forbes, 15. Sunny, portrayed by Samaria Campbell, 10, also a second-year camper. Jade and Westerly, played by Adalie Haviland, 9, and Claire Storer, 8, are both first year campers. During rehearsals first time camp director Droney, who has worked particularly closely with the ‘humans’, said “All four of the humans are very hard working and very talented and I have loved watching them bring their characters to life. I know that the audience will love watching them” Rounding out the cast are the werewolves, led by Tooth, and the vampires, led by Vashley. Each group has two songs they sing as well as their own backstage problems they’re dealing with. The werewolf leader, Tooth, is portrayed by first year camper Lillian Papinchak, 11. Other first year campers in the werewolf pack include Luke Reiser, 8, as Furball; Violet Papinchak, 9, as Snarley; Emily Walb, 6, as Puffy; and R’Néjah Hubbart, 8, as Crescent. Werewolves Moonface, played by Luke Caruso, 11; Growley, played by Aggie Collins, 11; and Grizzly, played by Lorelai Cramer, 7, are returning for their second year. Vampire leader Vashley is first time camper Bella Mager, 14. Other first year campers in the vampire coven include Eliana Lewis, 8, (Valissa); Danica Austin, 9, (Valexa); and Khadijah Thomas, 13, (Vecky). Joining their fellow vampires are returning campers Rykan Miller, 10, as Vladimir, Ellen Collins, 14, as Vazel, Elleina Smith, 8, as Vennifer, Felicity Cramer, 10, as Varah, and Vincenzo Vigliotta, 7, as Vanny. “The kids work super hard during camp. We start at 10am with singing and dancing and continue throughout the day rehearsing in smaller groups or creating the props, sets, and costumes for the show until 3pm,” said producer Jessica Ann Coder. “A camper has helped with or entirely created everything you’ll see on stage during the show.” “We Are Monsters - A New Children’s Musical” with books, music, and lyrics by Denver Casado & Betina Hershey is presented through special arrangement with Beat by Beat Press. BLT’s kid’s camp will conclude after two and a half weeks of rehearsals with three performances. The first performance will take place on July 21st at 7pm. The following performances are July 22nd at 7pm and July 23rd at 2pm. All performances will take place at Togi’s Playhouse, 18 Welch Ave, with doors opening half an hour prior to showtime. Tickets are $5 each pre-sale and are available by visiting Graham Florist or Togi’s Family Restaurant. They can also be reserved by calling Chelsea 814-598-9956. Tickets will be $7 at the door. There is no intermission for the play, but there will be cookies and punch for sale in the lobby before and after the show as well as candy-grams to send to cast members. “We Are Monsters - A New Children’s Musical” with books, music, and lyrics by Denver Casado & Betina Hershey is presented through special arrangement with Beat by Beat Press.